I'm always looking for new recipes to help me stick with my diet and when I ran across this cookbook I was excited. I've been on a ketogenic diet since late March 2016 and I've lost 110 pounds. I'm still looking to lose about 20 more pounds but the past year has been a bit tough on me so I've been maintaining. The recipes all look delicious and aren't super prep heavy where I'd be spending half the day in my kitchen for one meal. I've had that issue with a few of the other cookbooks I've tried and I'm too busy to do that. The book starts out explaining a bit about the diet and the benefits and things then moves on to the recipes. The types of dishes are grouped nicely into each chapter - breakfasts, snacks, appetizers, salads, soups, then the different types of meats each have their own chapter, and don't forget about the desserts at the end. The pictures are large and done well and I appreciated the nutritional information included with the recipes. I tried out a few of the recipes and my favorite so far is a super simple Chicken Alfredo with Broccolini (I used broccoli). With my food allergies I haven't found a good store bought low carb alfredo sauce that I wouldn't react to and always thought it was more difficult to make than it really is. The flavor was excellent and it reheats well which is a major plus in my book. I have a feeling several of the dishes from this cookbook will make it into our weekly meal rotation. It's always nice to try out new meals and I've found several which to me makes this book worth it. 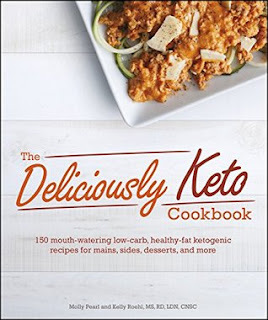 If you're starting a ketogenic diet or looking for more recipes to try like I was I highly recommend you try this cookbook! Glad you found a useful cookbook. I love when I find a new recipe that I love.